Hmm to trust a tweet? We've all been there before you know you see a tweet that a random celeb has died. In the olden days (well not that old!) you would have been like a midge to a lamp and retweeted or posted an R.I.P but things have changed, you've been burned once to often, Jeff Goldblum was alive! Now you wait for the BBC or CNN to post it or check their website. Most of us heard the news of Whitney Houston's death before AP tweeted it but we didn't trust it. I give two reasons first we've been burned before and also I'm certainly not likely to trust an account by Big Chorizo (simply because the name questions legitimacy). Twitter seems to be the biggest news source out there but with the lack of verification there is still hope for the traditional media outlets. MySpace is back baby! and it seems they have been listening and changed focus towards music 11 months ago they lost 10 million users in 1 month but according to them they are gaining 40,000 new users every day since the launch of the new music player in December and the largest free music collection in the world of 42 million tracks. They are clearly going after Spotify and with the same level of Facebook integration. Important things to note though are that the new users may actually be old users re joining and it is harder to revitalise a company that has fallen from grace than building a new start up in the Tech world. but at least this is a step in the right direction and part of what I said I wished for in an article last year. Information overlord Mark Zuckerberg sure is and has set up a page for all his pins here www.pinterest.com/zuck. Pinterst is by far the hottest start up of 2012 and has already reached 10 million users incidentally al'lot of which (including Zuck of course) have connected through their Facebook account and over 100 brands are connected from Sesame Street to UNICEF. Does Mark Z's profile mean Facebook are interested in buying the company or adopting the idea for the social network? 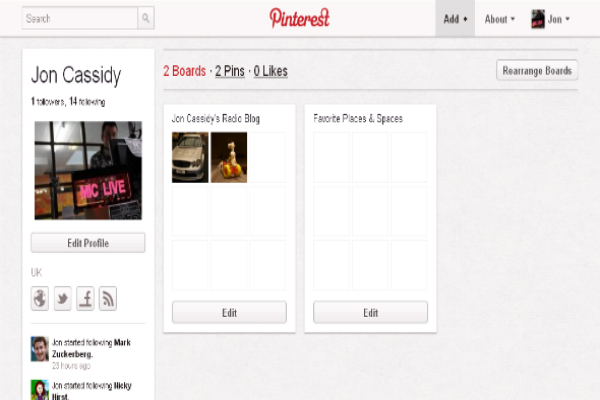 www.pintrest.com/joncassidy is where I'm at! While we are on the subject of Facebook adopting ideas! It's been announced they are to offer verified accounts for celebrities and other public figures. This is something Twitter and Google+ already do while showing a badge on the profile. Facebook are not going to show a badge on the accounts but they will give the users an option to display a nickname rather than their real name, they will also appear in your people to subscribe to more often. The feature will start as invite only to those users with high subscriber counts and the user will have to supply two forms of identification such as passport and birth certificate to ensure it is them. Last year there were rumours that Microsoft were building their own social network, rumours I didn't agree with as they are making too much money from Facebook it would be stupid to cut ties. Microsoft have created a website and Facebook social reader as an aggregator of social media trends across Bing, Facebook, Twitter and their venture with NBC BreakingNews.com but not Google+. How will that work out for the 17 year old Web Portal? I finally got a call from this scam. This is an India based scam that where a “Microsoft Technician” phones to to alert you that there is a'lot of malware on your computer and they direct you to a part of your computer called eventviewer this is a log of each time you send an error report. Say iTunes was running slowly and you try and close it down and you get the option to end now via a popup and another one appears saying send error report to microsoft. this does not relate to viruses. They ask to gain control of your computer remotely DO NOT ALLOW THIS!!!!. They then try and hard sell you software that you can actually get for free online. DO NOT GIVE THEM YOUR CARD DETAILS!!! !, Once they have your details they can and will keep taking money from your account. Microsoft will never phone you to report any problems!